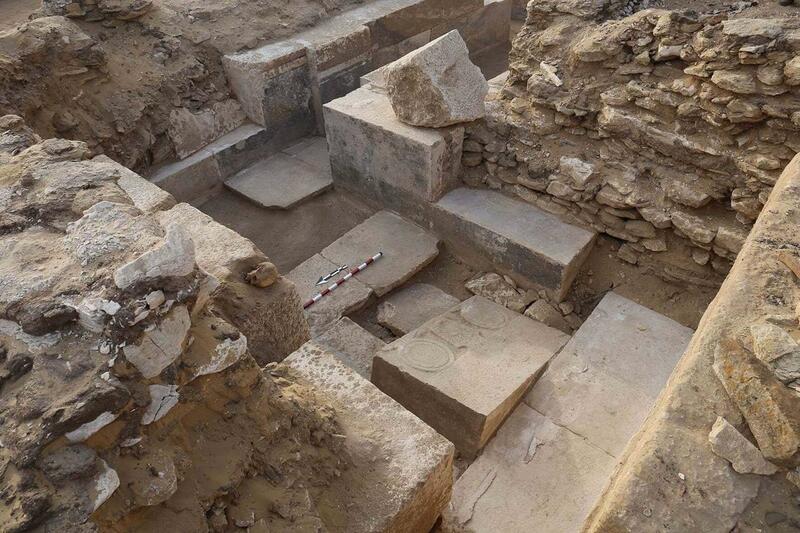 An Egyptian archaeological mission has discovered the tomb of a Fifth Dynasty dignitary named Khuwy during an excavation and documentation survey carried out in south Saqqara, and has also discovered the name of the queen to whom a pyramid complex in the area belonged. 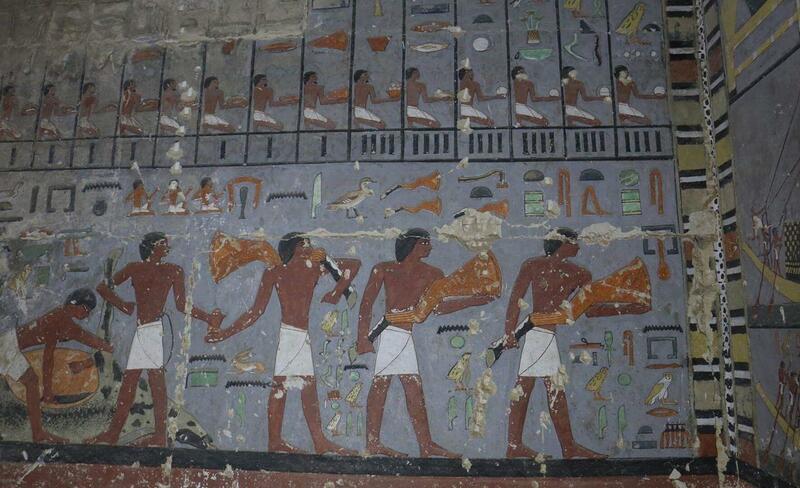 The tomb consists of a superstructure with an L-shaped offering chamber, which was once decorated with reliefs. Only the bottom part of this decoration is preserved, as the white limestone blocks of the other parts were re-used in the construction of other buildings in antiquity. Mostafa Waziri, secretary-general of the Supreme Council of Antiquities, explained that the mission has found at the north wall of the tomb, the entrance to a unique substructure, which is for the first time clearly inspired by the design of the substructures of the royal pyramids of the Fifth Dynasty. 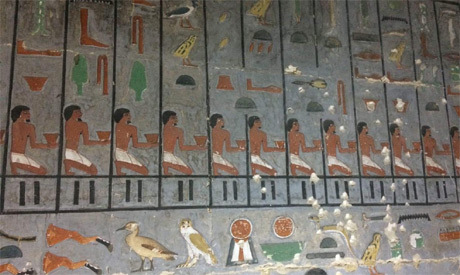 Mohamed Megahed, head of the archaeological mission, told Ahram Online that the mission located the undecorated burial chamber through two entrances in the west wall of the antechamber of the tomb. “It seems that the space of the burial chamber was almost completely filled with a limestone sarcophagus, which was found entirely destroyed by ancient tomb robbers,” Megahed added. However, the mission discovered the human remains of Khuwy, which show clear traces of mummification. 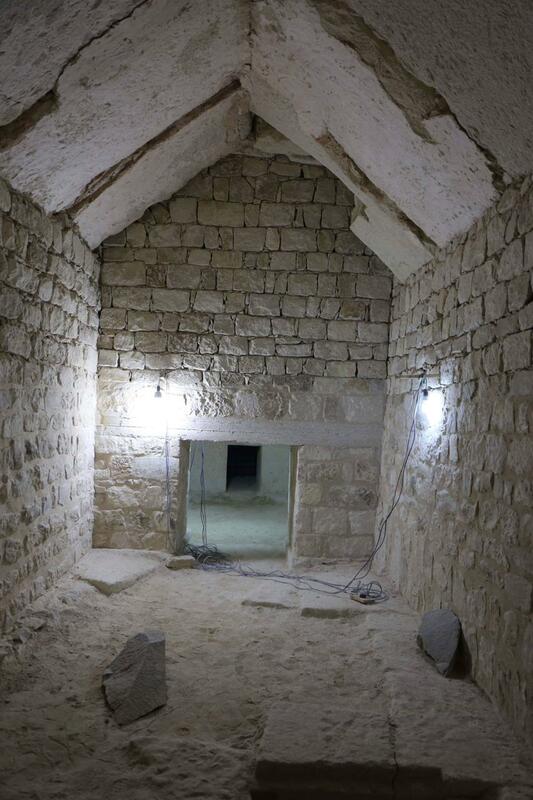 An entrance in the south wall of the decorated antechamber leads to a small room, most likely used as a storeroom. The mission found this room filled with debris, with no finds of any value. 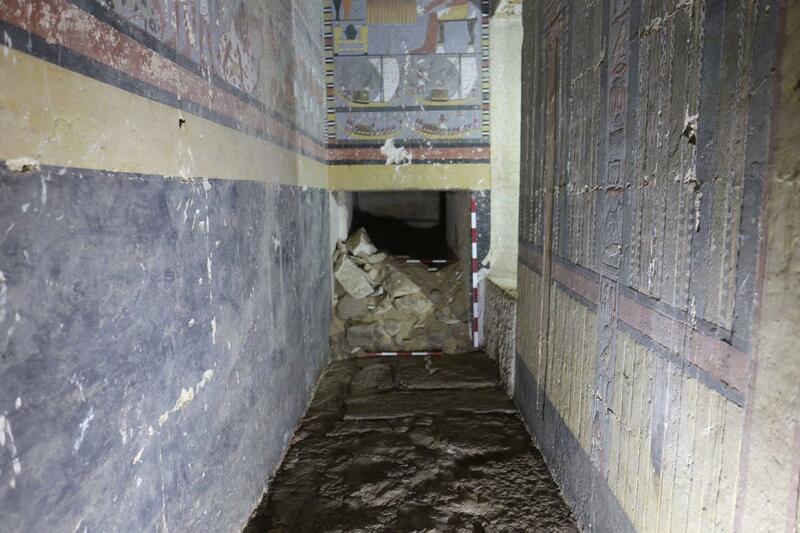 “The discovery of this tomb stresses the importance of Djedkare’s era, and the end of the Fifth Dynasty in general,” asserted Megahed. The mission, in cooperation with an international team of Egyptologists, has also discovered an ancient Egyptian queen who lived during the late Fifth Dynasty in the same pyramid complex. The mission found the name of queen Setibhor, who was not known before from ancient sources, engraved on a column in the south part of the until-now anonymous pyramid complex. The complex is located by the pyramid of king Djedkare in south Saqqara, and the identity of its owner was a puzzle that Egyptologists have been trying to solve for decades. The column and the limestone blocks and fragments bearing relief decoration from the temple of the queen were found during exploration and documentation work in the pyramid complex of king Djedkare. The pyramid complex of queen Setibhor represents one of the earliest pyramids in south Saqqara, built at the end of the Fifth Dynasty, and it is the largest pyramid complex built for a queen during the Old Kingdom. Moreover, her funerary temple incorporated architectural elements and chambers that were otherwise reserved for the kings of the Old Kingdom only. The large size of the pyramid complex of queen Setibhor and her title of queen may indicate her direct intervention in helping her husband, king Djedkare, ascend the throne of Egypt at the end of the Fifth Dynasty. It seems that Djedkare wanted to honour his wife by constructing her a huge pyramid complex, with many unusual features, including palmiform granite columns, which constitute an architectural element so far known only in the pyramid complexes of kings and not used in the temples of the queens during the Old Kingdom period. 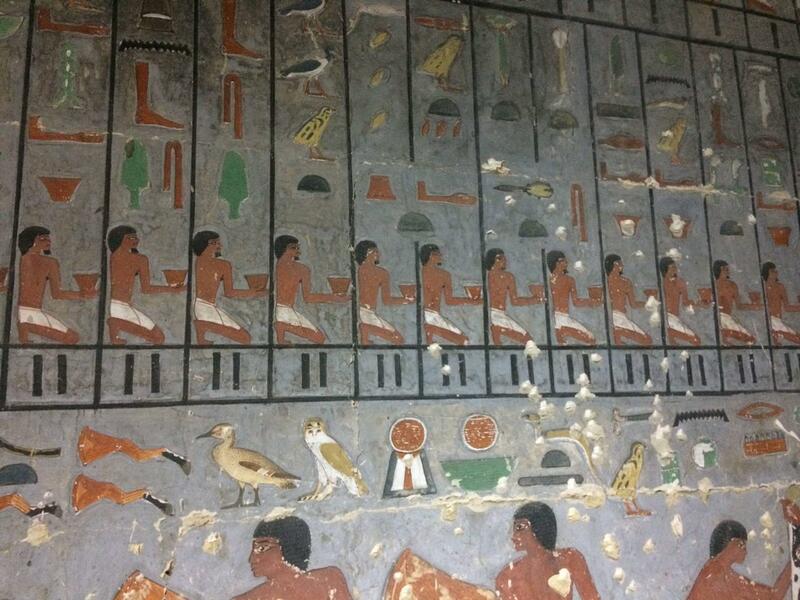 Megahed said that the mission has also completed the architectural restoration and consolidation of the substructure of the king’s pyramid, which had not been subjected to any restoration work before. The work of consolidation, restoration and reconstruction of the inner walls of the pyramid represented a vital task for the mission, he said. The mission is focused on the pyramid complexes of Djedkare and his Setibhor and their associated cemeteries, hoping to obtain more information on the end of the Fifth Dynasty and the beginning of the Sixth Dynasty. This period witnessed a radical transformation in ancient Egyptian ideology and religious beliefs, such as the appearance of the Pyramid Texts for the first time inside the pyramid of king Unas, the successor of Djedkare, and also the end of the practice of constructing sun temples, which all the Fifth Dynasty predecessors of Djedkare had done.